NYC chapter members advocate for the rights of people with hearing loss to effectively communicate in public and private venues. The availability of CART (Communication Access Realtime Translation) and other assistive listening devices at meetings, and at community and cultural events. The installation of hearing loops for effective, wireless access to sound (via telecoils in hearing devices) in theaters, houses of worship, senior and community centers, retail stores, auditoriums, lecture halls, and government meetings. Advocating for more favorable public policy and laws at the federal, state, and local levels in recognition that hearing loss affects people of all ages and impacts all aspects of their lives. 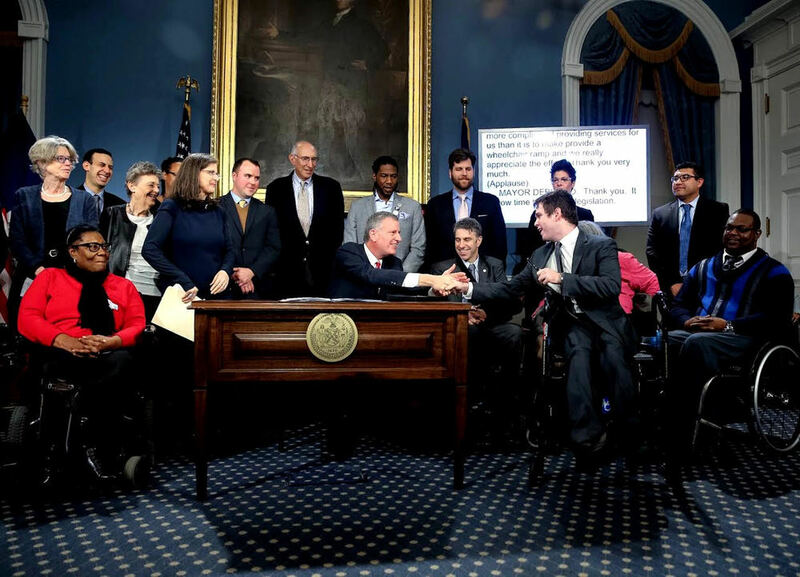 A HISTORIC MOMENT: Above, Mayor de Blasio was joined at the bill-signing ceremony at City Hall by, from left: Council Member Helen Rosenthal, HLAA-NYC Chapter President Katherine Bouton, MOPD Deputy Commissioner Kleo King, Chapter member and accessibility advocate Jerry Bergman, MOPD Deputy Commissioner Robert Piccolo, former City Council student intern Edward Friedman, and Council Member Elizabeth Crowley. On March 21, 2017, Mayor Bill de Blasio signed a bill believed to make New York the nation's first major municipality to require hearing loops in places of public assembly. The new law applies to construction and renovation projects funded by the City at a cost of $950,000 or more. Council Member Helen Rosenthal of Manhattan, lead sponsor of the bill, estimates that, under the City's current capital plans, loops will be installed in close to 300 new projects throughout the five boroughs. "Hearing loop technology makes such a radical difference in the ability of so many to participate fully in public life," said Council Member Rosenthal. "I'm proud that as a city we have moved to make it not just a priority but a requirement in our public investments." HLAA-NYC Chapter President Katherine Bouton added, "We look forward to the day when all who wear hearing devices can walk into City meeting halls and hear, understand, and communicate with others." The new law requires at least one assembly area and one adjacent security, information, or reception area to be looped. It also specifies that by July 2018 the Mayor's office must post on its website a list of such facilities owned or operated by the city. For details about the new law, click here. 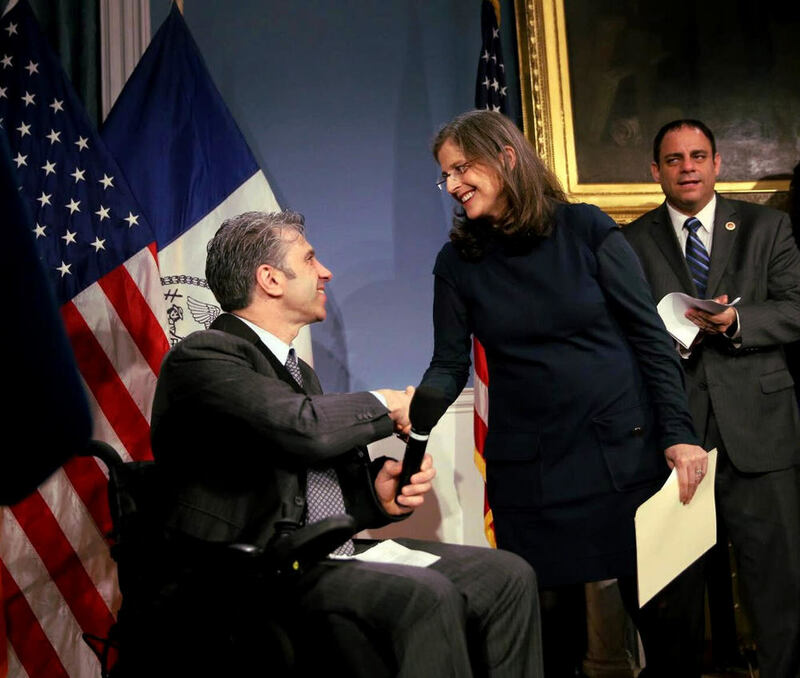 In 2016, Mayor Bill de Blasio signed into law two bills sponsored by City Council members Helen Rosenthal and Richie Torres and prompted by HLAA-NYC Chapter advocacy. HLAA Chapter President and National Board member Katherine Bouton and Chapter members Ruth Bernstein and Jerry Bergman participated in the ceremony. Each city agency is now required to designate an employee as its disability services facilitator. The facilitator is responsible for coordinating services for people with disabilities according to the Americans with Disabilities Act (ADA) requirements. Agencies are also required to post the names of the facilitators on their websites. Posters, invitations, and other publicity materials for city-sponsored events open to the public now must contain information on the types of accessibility at each event and deadlines regarding when requests for accommodations must be received. Agencies must encourage their contractors to comply with this requirement. Community boards and district councils also are encouraged to comply. Where possible, publicity materials are to include information regarding wheelchair access, CART, sign language interpretation, assistive listening systems, and other accommodations.